WOW – this very scholarly site is about as complete as one is going to find on the Northern European pre-Christian religions, and the links are Endless.Please click on the picture below to go to this site. The New Northvegr Center (NNC) is a private educational foundation devoted to promoting greater awareness and understanding of the history, culture, values, and beliefs of pre-Christian northern Europe. NNC believes that studying the primary sources and gaining familiarity with sound, modern scholarship on these topics is essential to meaningful learning. We believe strongly in promoting scholarship based upon critical thought. To this end, the Center maintains a comprehensive online library of texts, resources, reviews, and recommendations for individual or group study in this field. NNC’s extensive website offers a wide variety of classic and hard-to- find texts, some in original translation, for free browsing or downloading. The Center’s online subscriber service supplements this core library with timely and topical reviews and analysis of the latest and most important scholarly works, original research, and other unique resources. NNC recognizes and affirms that the pre-Christian Northern tradition has no connection to modern racism, which is an outgrowth of 19th- century racial nationalism. We are unequivocally opposed to those who bring our spiritual heritage into disgrace by combining it with racial hatred or separatist doctrines. We likewise repudiate those who promote a race-based parody of the Northern mythos through the misguided works of 19th-century Romantic nationalists, and fraudulent texts like the Oera Linda Book. The New Northvegr Center strives to promote a balanced approach to scholarship, accessible to all with a serious interest in learning. Genuine understanding of our spiritual heritage should not be confined to ivory towers, and those outside academia should have access to more than New Age paperbacks and self-published purveyors of fantasy. The New Northvegr Center seeks to bridge that gap. Vinland’s Volva – Daily Mystic is an interesting blog, and i really liked the post on Core-shamanism, oracular Seid and what Seidr really is. Even i have to admit to being guilty of using terms like shamanism and shamanic referring to some of my individual practices out alone in the woods, but i stand corrected. 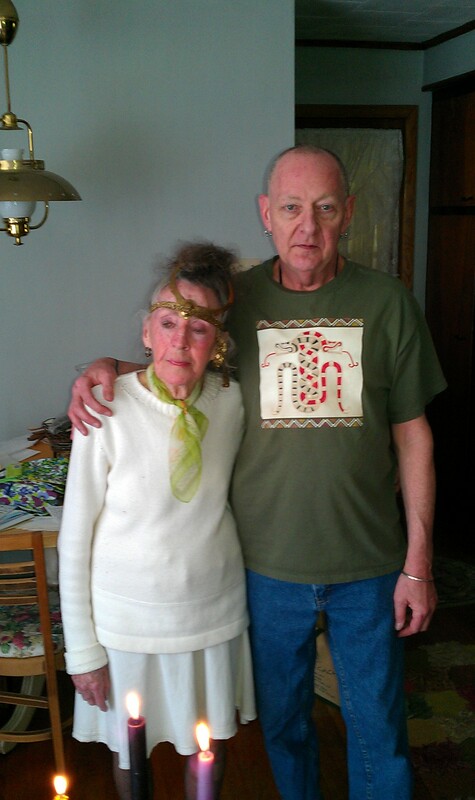 A shaman works within their community as a teacher, healer and gateway between the worlds, and i am Not that. 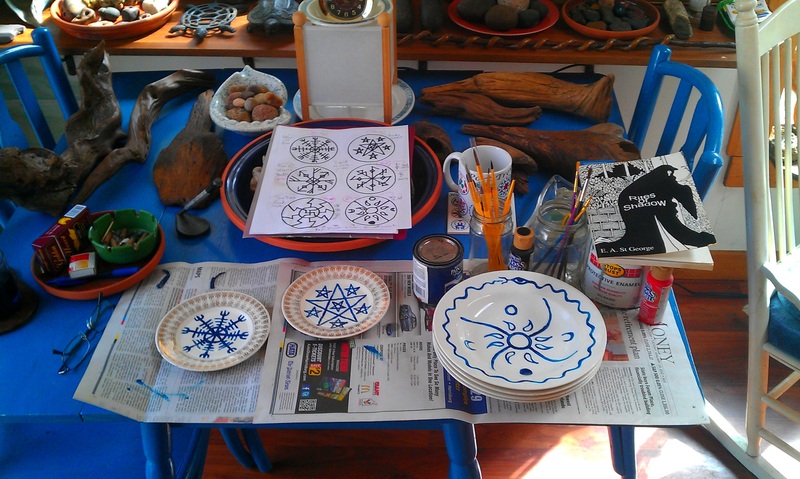 I just meditate, listen, look, hum or drum or wave a feather or crystal or phurba around, so i do not know what i would call it but it is Not shamanism as strictly defined here. .
Well we were having a winter thunderstorm and i finally got around to finishing my crudely painted Hex Rune plates for the four elements (see previous post for the first ones). The one on the left is black for earth with the Algiz and Ingwaz runes. The one in the middle is red for fire and the black sun design of Sowilo or Sig runes. The one one the right is silver for air and is a bind rune for health using Fehu Laguz and Ingwaz runes. I watched this 2 hour show on PBS last night about the Amish, who live all around us here in the Appalachians of central Pennsylvania. Of course I thought i knew all about them, but this program kinda blew me away. The part about the infamous Nickel Mine shooting a few years ago brought back bad memories too, but their level of forgiveness was the big story. I did not realize how much their religious beliefs and practices go back to the German Mystics of the Rhineland and to Christian Mysticism in general, a subject i have studied extensively over the decades. 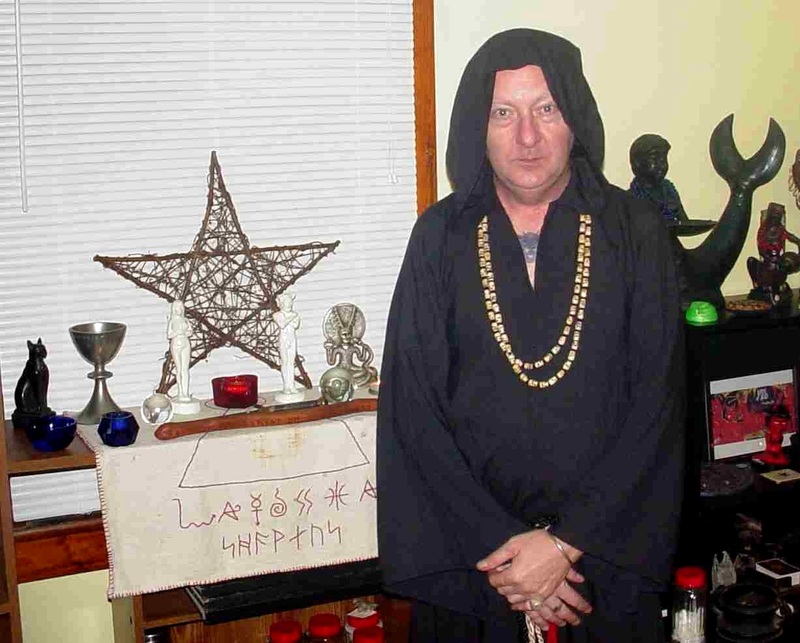 Now you may wonder how can a heathen Witch who practices Germanic rune magickes and who is a Vajrayana Buddhist and Shaivite can have sympathy for and even learn from Catholic or Protestant mysticism? Well when you are older and wiser you may understand, with me being older but only a little bit more wiser in all this. In fact this morning i am having somewhat of an Epiphany about the subject. All i can say about the Amish around me is that they are Good People. Here is a link to a part of this show on PBS below, and it can be bought on DVD also. I watched this video this morning and man is it scary. No wonder they take heads so easily. thanks KP. HEX Magazine looks like a great magazine on German religious lore and even Powwow. On this first page is a free downloadable PDF which is from one of their early magazines. If you hit this picture below it will take you to their Links page which has lots to explore. Enjoy. I recently had a surprising comment in this blog where the writer said I was not a witch. Perhaps it is because i post so much on Tibetan Buddhism, and YT videos and other subjects unrelated to Witchcraft. Normally i would not respond to such a question, and i know i do not post much here on Witchcraft but i still list this as a Witchcraft blog. Fact is this is a blog, not a Book of Shadows or a training and teaching forum for my practices and lineage, which in my lineage is a closed system only for those initiated in it, so No i am not posting much about Witchcraft here. 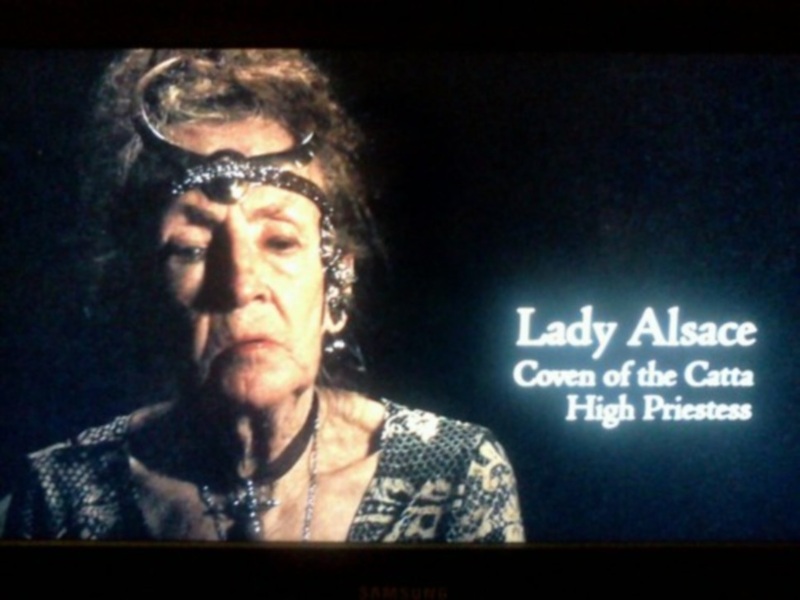 As for the facts, which i stated in an early posting, I started training in the Craft in 1981 and received my third degree a few years later and ran the Coven of the Catta as Priest to various Priestesses, but primarily under Lady Phoebe until her passing, and now under Lady Alsace my High Priestess. Any further questions can be answered at my Coven’s website Coven of the Catta or from the booklets i have published at Lulu.com. And yes, a Witch can be a Buddhist can be a Powwow can be a Hougon can be a Yogi can be a Shaman can be a guy who sits in the woods just listening and who likes jokes and world politics and YT videos. Bottom line – Yes i have been doing this for over 31 years now. And Yes we are both “out of the witches closet” as Witches for sure in our respective communities. 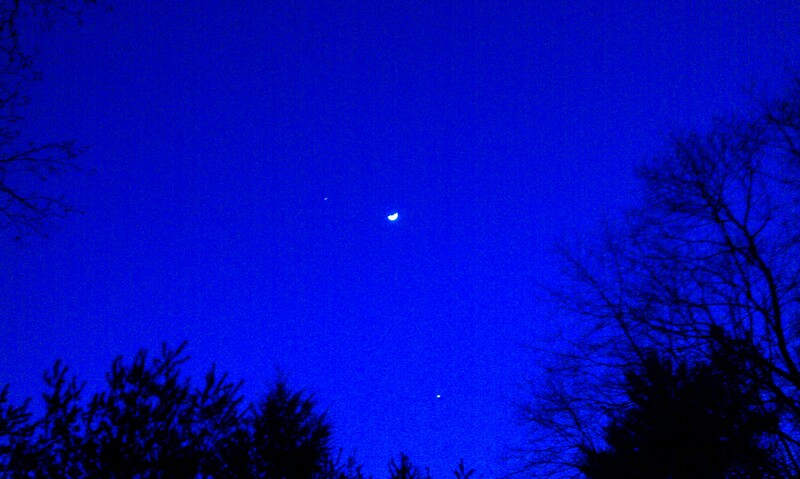 It was beautiful tonight just past sunset, finally a clear evening, as Jupiter, the waxing crescent Moon and Venus glowed brightly in the dark blue sky. 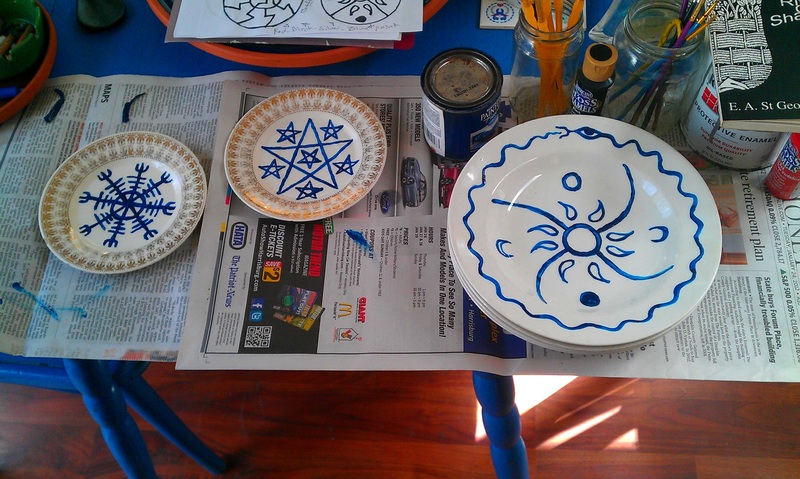 Well after months of looking at these plates from my late Dad’s river cabin sitting on my counter with plans to paint them, I finally started with the blue paint on the plates for the Helm of Awe, Lucky Stars and a design i came up with for Water Blessing based on the traditional Pennsylvania Dutch Hex Sign for water with the droplets coming towards the property in the center, the phases of the moon, and of course der Blau Schlonge (Blue Snake) design around the rim. Next, the other elements shown in the designs above them in red for fire, black for earth and silver blue for air. I am Definitely not a painting artist, but i did the best i could with my neuro and eye problems, and hey, that’s why they call it Folk Art because we “folks” do it just for ourselves in our home, not for show, “yust fer pretty” as the Amish say.. It was only a matter of time. Thanks KP for this link which you can go to by clicking on the image below.